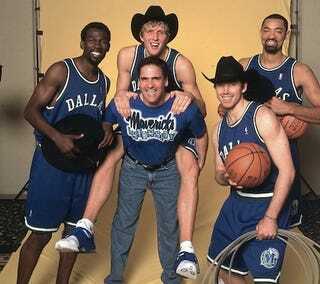 This photo was taken circa 2001 by Sports Illustrated, a year after Mark Cuban bought the Mavericks and began reaching for the brass ring. Those were happy days. Magnolia flowers impregnated the Texas air with sweet perfume. Children gamboled by the Trinity River. And these cowboys loved each other. So very much. Two of them even more so after last night's game. Glad you could make it today.